10.00 to 18.00 Monday to Sunday. 10.00 to 17.00 Monday to Sunday (mid-January to mid-February. Late spring or early summer are the best times of year to visit. We are comparing New York Botanical Garden Ticket Prices from leading ticket suppliers and Try to find you Cheap tickets prices on the market. New York’s Botanical Gardens is one of the best in the world. Open since 1891, this green paradise provides a tranquil respite from the noise and rush of Manhattan. The park is large enough to spend an entire day if you chose to take a picnic, good company or a good book. With over 50 gardens and countless species of plants and flowers you certainly won't run out of things to see. During the spring months, the New York Botanical Garden is the perfect place to see orchids spread their petals, while, during the winter months the site hosts festive exhibitions for its visitors. By purchasing an entrance ticket to the gardens in advance you’ll be able to bypass the cash desk and start exploring the park even sooner. 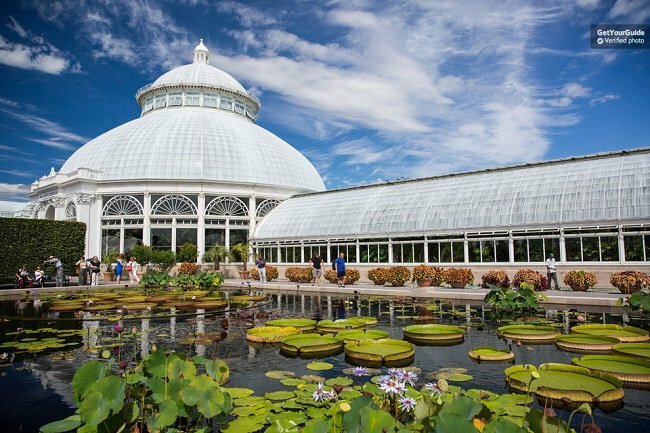 The New York Botanical Gardens are simply unmissable for nature lovers and gardening enthusiast, as well as people who want to experience some of the ‘great outdoors’ whilst in the centre of New York State. The park has good facilities which are great for children to play, adults to relax and for everyone to learn about the flower and plants which thrive in this massive city park. Your Experience With New York Botanical Garden Ticket? Take a step away from the madness of downtown New York, leaving behind the traffic jams and zebra crossing, and immerse yourself in a 25-acre Botanical Garden. Breath the fresh air one of the worlds best gardens while exploring the parks many trails. Have the chance to see new and unique exhibitions hosted inside the park. When your feet grow tired take a break in one of the charming café’s. Or, when you fancy something a little faster, hop on the Botanical Garden’s tram and for a ride around the park. Visit the Rock Garden dating back to the 1930’s and take a moment to smell the magnolias, azaleas and gorgeous roses. What New York Botanical Garden Ticket Includes? Full entrance pass to the New York Botanical Gardens (including access to the Rock Garden, Enid A Haupt Conservatory, special exhibitions, and Everett Children’s Adventure Park. Tram tour of the Gardens. Multilingual audio guide (available in English, Spanish, Portuguese, Chinese, and Japanese. The Botanical Gardens extend for 250 acres and there are many walking paths, therefore we recommend wearing flat and comfortable shoes (such as sneakers) and dressing appropriately according to the weather. Travelers Reviews about New York Botanical Garden Ticket? Visiting the New York Botanical Gardens is a very popular thing to do in the Big Apple. TripAdvisor users have rated the attraction with 4.5 out of 5-stars while Get Your Guide users give it an impressive 4.8 out of 5 and Viator users have left an overall 5 out of 5-star score! People who have visited the park say that there are fantastic displays of beautiful flowers, particularly during the springtime. Comments agree that the onsite staff are friendly and helpful and that the free walking tour is informative. Many travellers also talk about the interesting exhibitions that you can see in the park. The New York Botanical Gardens are wheelchair accessible. There are also wheelchairs available to use at the park. Ticket confirmations will be sent to you on the day of purchase via email or SMS. You can take your printed or electronic ticket to the Visitor Centre (by the entrance to the Botanical Gardens) and exchange it for your All-Garden Pass. The Botanical Gardens are open all year and in all weather conditions, there are many walking paths inside therefore you should check the weather conditions in advance and dress appropriately. The Rock Garden is closed from November to March. Address: 2900, Southern Boulevard, 10458, New York. Train: take the Harlem Line North from Grand Central Station.